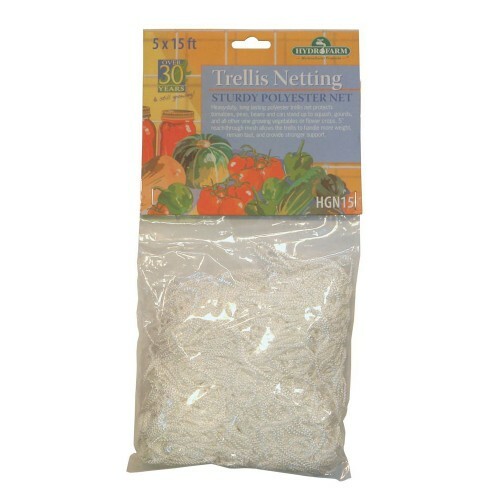 Heavy duty, long lasting polyester plant support trellis netting features 5 inch reach-through mesh that allows the trellis to handle more weight, remain taut, and provide strong support for growing plant crops. YOYOs are very basic and easy to use. Each YOYO unit needs to be hooked onto something, there is a l..
For best results - use 2 or 3 StretchNets per 2m high tent dependning on the height of your pot.2.. The BioBizz Complete 240cm Wide Grow tent Kit includes everything needed for 10 large organic soil g..
Trellis Netting 15ft x 5ft ..